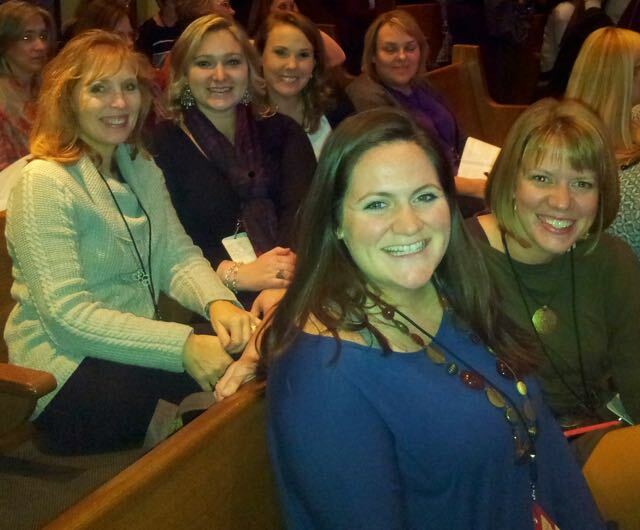 I spent the weekend at Lifeway’s Women’s Ministry Leadership Forum in Nashville. I was so blessed with a group of 15 amazing women from Willowbrook to travel with me. We worshiped together, ate together, dreamed together and learned together. Each of us were equipped to better lead women to Jesus. This particular conference is one of my favorites because God has given me such a heart for women. Before I left for the Forum, I realized God was honing my passions just a bit more. Through the past few years, God has brought to my attention just how important it is to develop leaders in ministry. I’m not talking about staff members. I’m talking about leaders. Leadership is not about position but about influence and relationship. As believers, each of us is called to lead–to influence others through relationship. However, few of us view ourselves as leaders. We have put paid ministers, Sunday School teachers or just about anyone with a title on a pedestal and called them a leader. We wouldn’t be wrong in our categorization but we would be mistaken if we neglect our own influence and responsibility. Unfortunately, there are too many people poorly stewarding their influence potential. As a leader, myself, it isn’t enough to just believe in leadership potential. It is my job to help develop and equip leaders. God has put in my path a ministry friend and partner by the name of Shelly Hollis. Over a year ago, God put a vision on Shelly’s heart to equip women in North Alabama to lead. God was stirring this same vision in my heart and we quickly began dreaming together. 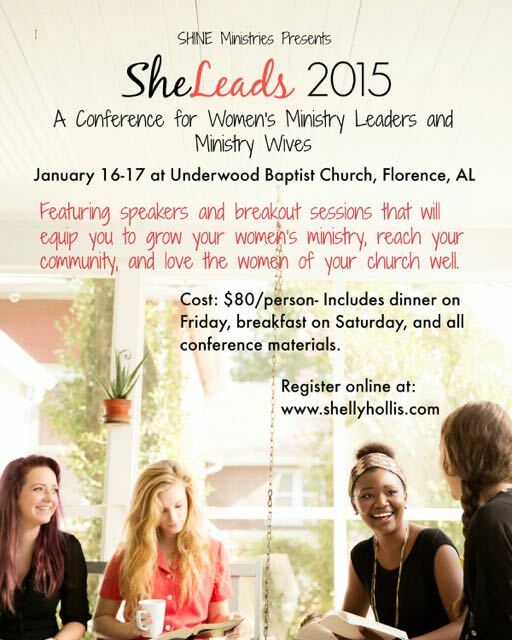 Last year, Shelly launched the 1st Annual SheLeads conference. I was privileged to not only lead a couple of breakouts but take part as well. This year, Shelly and I have joined together to host this conference in Florence, AL. So, here it is…a fantastic opportunity to grow as a leader and I want to extend the invitation to any woman in the North Alabama area to join us for this event. We are not only focusing on Women’s Ministry Leaders but adding a Minister’s Wife focus this year as well. This is an event I am passionate about. I think it so important to develop leaders who can make a difference for the Kingdom of God. More importantly we are connecting women who love Jesus across our area with one another. I’ve discovered there is so much to learn and be shared by just sitting down and talking with one another. At least two of the attendees from last year came from churches with no active ministry specifically geared for women. Both of these women held great events for their women, but more importantly, they provided opportunities for growth and fellowship to flourish in their congregations. Isn’t it cool to see how God uses us to further His Kingdom? I’d love to have you join me and some of the women’s ministry staff at Willowbrook as we share some of what we’ve learned through our experiences. We would love to connect and learn from other women around us who are doing ministry. To register, you can click here. If you have questions, shoot me a message or comment below and I’d be happy to help you out!